If you are ready to learn skills and tools that will increase your quality of life with a chronic health condition, then join our next class: “Montana: Living Life Well”! 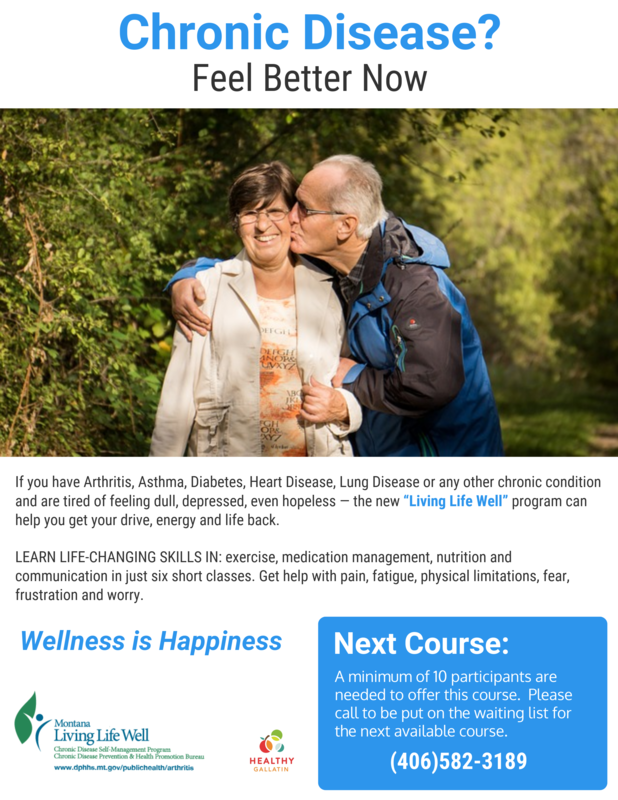 Living Life Well is a free class for people with chronic health conditions, or who are close to someone who has one. Chronic health problems include mental, emotional, and physical conditions that you deal with on a daily basis. This class talks about parts of life that are harder with a chronic condition. It will include brainstorming, group discussion, and practicing new skills. Participants will learn how to manage illness and symptoms, how to make good decisions, how to problem-solve, and how to make an action plan. Topics include how to talk with doctors, ways to deal with emotions, and how to deal with pain. We also discuss getting enough exercise, eating well, and getting good sleep. People who have taken this class have reported they are in better health. They also have reported money savings by visiting the hospital less. Some of the improvements are confidence in doing everyday tasks, less stress about health, and better relationships. Participants also reported they were able to get enough exercise, and could manage their symptoms better at home. Classes are currently held in Bozeman, Belgrade, and Livingston. The class meets once a week, for six weeks. Each session is about 2.5 hours long. Send us an online inquiry below!